Simba. One word. One man. Lion. That was how the Kenyans knew Bjorn Waldegaard. And he certainly was the king of African rallying. Born in Rimbo, in the east of Sweden, Waldegaard started competing aged 19. And his natural talent was immediately obvious: he was on the podium on the Swedish Rally within three years and Swedish national champion two years later. The mainstay of Waldegaard's career was bookended by success in a Porsche. 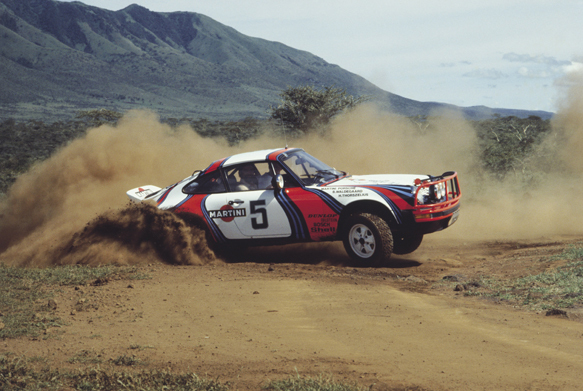 In a career that spanned five decades, he won the 1969 Monte Carlo Rally and the 2011 East African Safari Classic in a 911. Not only does that highlight the incredible longevity of big Bjorn - or Walle - as he was known locally, but it also demonstrates his ability to drive on all surfaces. It would be easy to pigeonhole a man who has won the Safari four times and the Ivory Coast three times as an African specialist. He was. And he loved Africa. But how many African specialists can win on the snow in Sweden or edge Sandro Munari in a Stratos in Sanremo? As much as he will be remembered by his countrymen for his victories at home in Sweden or in Africa for his huge success on long-distance events, that 1976 win over Munari will always be something special. After more than 10 hours of competitive driving, the Swedish Stratos was just four seconds ahead of the more fancied Italian-flagged car. Waldegaard wasn't always the most popular fellow with the Turinese; when he announced he was moving to Ford in 1977, his Stratos entry on the RAC was cancelled. Out of contract, Bjorn called Boreham and asked if it was possible to start work one rally early. He did - and then rubbed salt into Lancia's wounds by edging Munari for the final step of the podium. 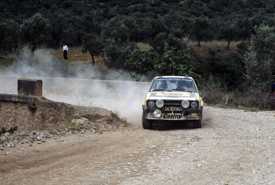 Waldegaard soon settled at Ford and collected his first Safari success at the wheel of an RS1800 in the middle of 1977. He ended the year on a high with victory on the RAC Rally. Two years later and he was chasing a championship, battling with Hannu Mikkola. The Ford team-mates were neck and neck through the first half of the year but Waldegaard took the advantage with victory on the Acropolis Rally and then took another step towards the title in Canada, with a win on the Quebec Rally. They locked horns on the RAC. Mikkola was peerless and won the event, despite a strong challenge from Markku Alen's final hurrah in a Lancia Stratos. Waldegaard was in the mix through the opening day, but a puncture and broken jack on Hamsterley in the early hours of day two dropped him down the order. He ended the event ninth. With one round to go, Waldegaard led Mikkola by six points. But there was a complication, the Ivory Coast Rally in west Africa held little interest for Ford. The fight for the first ever drivers' World Rally Championship looked like it might end in something of a damp squib, until Mercedes stepped in and offered a 450 SLC apiece. Ford agreed and the pair set about the fight one last time. Again as team-mates. Mikkola won. But second place for Bjorn was enough. He took the inaugural title by a single point. "He was one of the few drivers I trust 100 per cent," Mikkola told AUTOSPORT. "Whenever we were in the same team as each other, I had such high respect for him - even when we had these big fights on the rally. He was a great guy." Waldegaard was third in the championship the following year, when he spent much of his time driving a Mercedes, except for on the RAC, where he made his debut with Toyota. And that was the start of a truly beautiful relationship. He would spend the remainder of his professional career with TTE, and much of each season in his beloved Kenya preparing for the Safari. It's fitting that the final time Bjorn was seen in a rally car - at this year's Goodwood Festival of Speed - it was at the wheel of a Twincam Turbo. 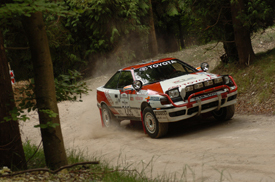 Long-time co-driver Fred Gallagher spent a lot of days sharing the inside of a Toyota rally car with Waldegaard. 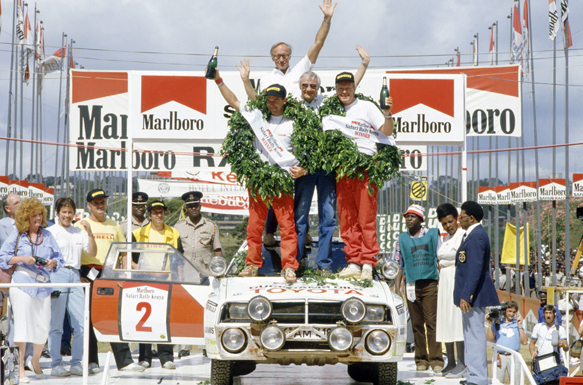 "Everybody knew Bjorn in Kenya," said Gallagher, who co-drove Waledgaard to his final Safari win in 1990, when the Swede became the oldest man ever to win a WRC round, aged 46. "No matter where you went, they all knew him and they all knew what he could do in a rally car. He really was one of the special ones. "He was a genuine team player. When Juha [Kankkunen] and I won the Safari in 1985 - which was both of our first world championship wins - it was helped in no small part by the way Bjorn worked with Juha and tutored him in the way of driving out there. A great, great guy." Waldegaard remained fully engaged in the sport until the end. Up until the start of this month, he was still expected at next month's Rallyday. He will be sorely as sorely missed at Castle Combe as he is around the world tonight. AUTOSPORT extends its deepest sympathy to his wife Anita, his family and many friends.